What makes someone want to start a tea farm, here in a country that drinks relatively small amounts of the stuff and grows even less? Among the few people who could provide answers to this question are longtime tea farmer Bill Hall. The United States has never grown much tea and yet we have something of a tradition of growing modest amounts. Many of the experiments with tea here have taken place in South Carolina, where the climate and soil are suited to this sort of thing. While some experiments were made at growing tea in Georgia in the mid-eighteenth century, it was about another century later before tea growing really got underway in South Carolina. Nowadays tea is produced there at the Charleston Tea Plantation. 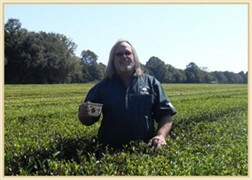 Tea has been grown at this location on Wadmalaw Island in South Carolina’s Lowcountry for over 50 years. However, for the first 24 years the operation was run by a major tea firm and was more focused on research and development. In 1987 it was purchased by Hall, who took things in a more commercial direction, later partnering with another tea company and offering a unique product known as American Classic Tea. Hall’s years of experience in the tea industry left him well-suited to run the only American tea estate of any size. It was about the same time that tea started to be grown at the plantation, in 1963, that Hall began pursuing his own course in the tea industry, cancelling his plans to join the Navy and taking work in a tea warehouse instead. Next up he worked in London for a British tea company, spending four years there as a tea taster. After that he took a turn as a tea buyer, travelling in Asia and South America, as well as working for an Argentinian tea firm for a while. By 1975 he had opened his own tea trading company. The rest was history, which in the case of Hall, an American tea pioneer, of sorts, is not just an expression. In addition to offering some of the first American grown tea to ever make it to market, the plantation also capitalizes on its position as the nation’s only working tea plantation of significance. It hosts weddings and other events and has also become a tourist destination of some note. Each May, as the tea harvest gets underway, the site plays host to a celebration of tea known as the First Flush FesTEAval. Perhaps one of the most fitting tributes to Hall’s vision of American grown tea is that American Classic Tea is kept on hand at a rather prestigious location known as the White House.